Eyedentity is the first solo exhibition in Asia by the Franco-British artist Stephane Graff. Graff is strongly influenced by psychoanalytical theories, focusing mainly on the themes of identity and memory. His series of banquet paintings depicting large social gatherings explore the relationships between the ego versus collective identity, and between the observer and the observed within a social construct. Eyedentity will include a selection of works from the artist’s most famous series, including the photorealistic monochrome “Black Box” paintings (since 1991), in which the artist enigmatically conceals the eyes of his subjects creating a void and, at the same time, a bi-directional dialogue between the subjects and the spectator. Also on display will be his most recent “Glitch Paintings” (2016), which explore the impacts of the digital era upon image making. This body of work was originally inspired by images that the artist saw on the television, distorted by a powerful electrical storm. These include a series of oil paintings drawn from Alfred Hitchcock’s classic films Rear Window and Vertigo. As curator James Putnam wrote: “Graff’s unique techniques offer numerous variations of rearranging and distorting an image giving an animated effect similar to pixilation or the flickering of an old television and represents an interesting relationship between the analogue and digital”. 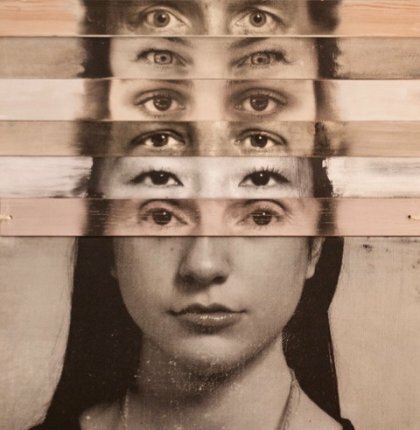 Eyedentity will also include the impressive “Mille-Feuille” oil paintings (2013 onwards), which have been made on hundreds of strips of wood and then re-assembled to create effects of movement and distortion. This unique process, invented by Graff, blurs the boundaries between painting, photography and sculpture.